… where you see someone holding a pen or flashlight-like object, and you can see the laser beam or laser "dot", contact local authorities or the police if necessary. Simple harassment -- a beam on your skin or clothes -- is probably not punishable unless it continues, or unless it occurs during a critical situation such as driving. Deliberate aiming at your head or eyes is serious due to the unlikely but possible potential for causing eye damage. For more on eye damage, see this information on how much laser power it takes to cause eye injuries. If you have had laser light in your eyes, see the page If you are hit by a laser. A partial list of laser harassment incidents is here. … first consider all the non-laser explanations for what you are experiencing. For example, plants can turn brown (see Letter #1 below) due to many factors other than laser beams. Also, if you feel heat spots, consult your doctor or do an Internet search since there can be medical conditions that cause localized and/or intermittent feelings of being hot. If you really want to pursue this, get photographic and/or video evidence if at all possible. Ideally this would be pictures of the beams or the laser "dot", and also pictures of any damage. Occasionally we get emails or calls from people who are sure they are being deliberately targeted over a long period of time, by angry neighbors or agencies such as the CIA. They clearly feel effects, but their symptoms are often inexplicable by normal means. For example, laser beams have gone through solid walls and they can feel heat on their skin. At LaserPointerSafety.com, we are not experts in any directed energy. We are only experts in visible lasers. The light from visible lasers can be seen with the eye and can be recorded by a camera. A visible laser’s light can be blocked by anything that also blocks conventional light, such as a solid curtain or a wall. Beyond that, we do not have expertise about non-visible lasers or directed energy devices. Mysterious attacks in Cuba — a device or a "shared functional disorder"? Persons who feel they have been targeted by mysterious enemies with directed energy devices may want to consider the case of the U.S. diplomats in Cuba. Why would ordinary citizens be targeted? It seems unlikely that directed energy devices would be available or affordable to ordinary persons who want to harass other persons. Or whether such devices would be used by the government against ordinary citizens who don’t have vital state secrets. We cannot help with issues about non-visible lasers or directed energy devices. However, below are some resources which may be of interest to persons who feel they are deliberately targeted by mysterious devices. The first two resources have links to other websites, organizations and videos of interest (too many links to list here). Thanks to Jeannie for her help with this list. People Against Covert Torture & Surveillance, International From their home page: “PACTS, International is a support network for those targeted with organized stalking and remote electronic assaults, also known as electronic harassment. Electronic harassment in this context refers to the use of radio frequencies and other methods to remotely access a person's mind and/or body to gain control of the individual or group of persons.” Much of the information at their site is in links to their newsletter, such as this newsletter page. The 2015 Covert Harassment Conference in Berlin. This contains videos and a list of the program; the material is in English. There was also a 2014 Covert Harassment Conference. A 2002 presentation by Dr. Reinhard Munzert, “Targeting the Human with Directed Energy Weapons”, here and here among other places. 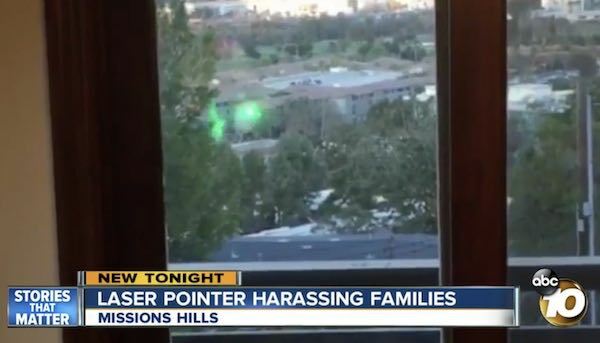 Here is a case in 2018 of a visible green laser harassing homeowners at least five times over two weeks. The laser can easily be seen coming from a known location. But because it is the common-area hallway of an apartment, the perpetrator was not known. Below are some sample reports of mysterious use of lasers, or suspected lasers, along with our responses. This information may help others in similar situations. We live across the street from a neighbor who has her laser lights on 24 hrs/7days a week. She shines her laser lights in other neighbors faces, heads, at children, family pets, windows of houses, plants and trees (which are singed from being over exposed/burned by laser lights), aircraft, on our parked vehicles, & vehicles driving down the street. When I have been in the front yard my eyes and face start burning from the lasering. The police have been called several times, but state that they cannot do anything. Do you have any suggestions on how to go about getting this individual to stop harassing & terrorizing us? You described your eyes and face burning when in your front yard. It would take a very powerful and expensive laser to do this. A simple laser pointer would not be able to create heat on your skin at a long distance such as across a yard. The most powerful handheld laser currently available [summer 2010] is the 1-watt Wicked Laser Arctic. It can burn skin but at a very close distance, and the burn is very small such as the size of a pea or less. You also stated that various surfaces were singed. Again, it would take a very, very powerful and VERY expensive laser to do this. It is very hard to imagine any use outside of military or police (riot control), and even these are exceedingly rare. Both photos that you sent have a vertical line that goes through a strong light in the photo. This straight line is NOT a laser. It is an artifact of how some digital cameras work. If there is a light source that is too strong for the camera's digital chip, then all pixels in the same vertical line will be overwhelmed. This is called blooming. You can read more about blooming here. One question I have for you is whether you have seen laser beams with your own eyes (not from a camera's video). I am guessing the answer is "no". I do not want to say absolutely, positively 100% that there is no laser activity from your neighbor's house. The world is very large, and every now and then there are strange things. However, I am 99.999% sure that there is no laser activity from your neighbor's house. Certainly the photos you have sent depict the blooming effect that is very common on some digital camera chips. There is no doubt that what is in the photos is NOT laser. The other effects you state, such as heating and singeing, are highly, extremely unlikely to be caused by any type of laser that a residential person would have access to or could afford. I have been getting burned for now about a year. I have been finding burn holes in my mini-blinds. My dog I have found burn holes on her skin also, Is there anything I can do ? It is really painful and I think they did this so I had to sell my home because I felt that my life was in danger I would be walking in the house and then I would get this burning sensation in my eyes and then I would fell my arms would be burning didn't matter what side of the house I was at I would get burned, I would tell people and they would say that's weird. So I sold my home because I feel they chased me out by hurting me and my dog. I think they even killed some kittens with this laser flashlight. I am writing to you cause no one help me or those kitten that didn't make or had a chance, I think there should be a law against this it is really scary and painful. Thank you for having this information on the internet and maybe it can help someone. It is very difficult to use a laser to create holes at long range (more than a few yards or meters). It also requires a very expensive laser, to have enough power to make holes at long range. I would not know why someone would go to this trouble. If what you are seeing is small, pinpoint holes, it is highly unlikely that these are from a laser aimed at a distance. Laser beams do spread out, even a little bit. For example, the beam at the aperture (output opening) of a powerful laser might be very small. This might be a few millimeters or up to 1/4" in diameters, and the edge of the hole would be sharp. At a house-to-house distance, the hole might be the size of a quarter at least, and the edges might be more ragged, with burn or scorch marks around the hole. It is possible for the laser beam to be invisible to our eyes. Infrared lasers have beams which we can't normally see. 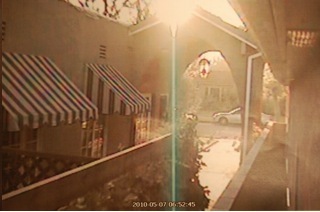 However, you can use a camcorder to try to see these beams. To try this, point the camcorder at an infrared remote control, which are very common for TVs, etc. When you press a button on the remote control, you should see a light flash in the camcorder viewfinder (but not with your eyes). If your camcorder can see the infrared light, then you should be able to see infrared laser beams using the camcorder's viewfinder or fold-out monitor. If someone is using a laser in the way you describe, this is illegal. It is damaging your property, cruelty to animals, and assault & battery. You could call the police -- but you should be sure that you really do have evidence. For your own sensations of burning, you may also want to consult a doctor or do research on the Internet. There are some conditions where you may experience burning due to something internal in your body. When I read the two stories of people getting harassed by laser pointers, I thought I was reading about my own story. 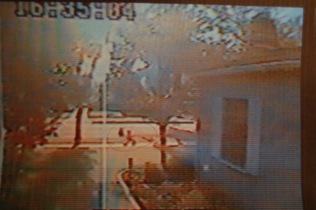 I was also getting harassed by our neighbor. We complained to the police as well, but we got no help. Both me and my husband saw the green dots, still the authorities were not convinced. It's very difficult to film, since he changed locations from the window and could see us if we try to film or take picture. We finally moved from there and thought it would be over but to our dismay it continued in the second home. We moved in the same area, it was not far enough. So, I started to do the research about laser pointers and their health risks on people. Here are a couple of suggestions: First, go to your Home Depot or Lowes and get a mirrored privacy film and stick it to your windows. Make sure your windows are completely covered. This will at least give you day time privacy and if they point the laser pointer at it they will get twice as much effect on themselves. Second, do not close your house completely. Leave your windows a crack open, because depending on the type of laser and its strength, all lasers emit radiation. The radiation further dries skin and increase the burning, and does not help in healing. Third, use coconut oil to moisturize skin. And, last, get as many humidifiers and run them until there is enough moisture in the house. This will negate the effects of radiation plus it will provide you with a relief from burning. I hope this helps. Good luck! Finally, thank you for printing those articles, I thought I was alone. It is helpful to read what other people are going through. We have found a few people who, even if they moved to a different state, still said they had symptoms of being harassed by lasers. It is more likely that there is something about the person -- some medical or perhaps brain condition -- which is causing the symptoms. We urge such persons to get a medical exam and to stress to the doctor that you really are feeling these sensations (heat, etc.). We are printing the information above because it may help others. The first point is good. If a problem is being caused by visible light lasers, then light-blocking curtains, shades or films will eliminate the problem. You can also simply go into a room without windows or other openings to the outside, and see if the symptoms go away. Visible-light lasers, with a dot or beam that you can see, will be blocked by walls or other light-blocking material. It is theoretically possible that an infrared laser's energy might go through a lightweight material, but even here, putting a wall between you and a suspected laser source would block the infrared light. The second point is not really accurate. Lasers do emit "radiation" -- electromagnetic radiation such as visible, infrared or ultraviolet light. Lasers available to the general public do not emit higher-energy nuclear radiation such as X-rays or gamma rays. Leaving windows open will not have any effect on light or radiation; for example, even a beam of X-rays will not somehow "build up" in a house. The third and fourth points may help. If you do feel burning sensations, a cream or extra moisture in the air may well help.